Sgt. 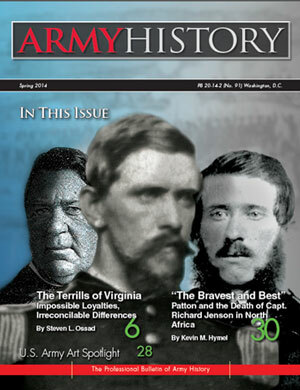 Martin J. Cervantez, "A Huge Responsibility"
The Spring 2014 issue of Army History features two intriguing articles. The first, by Steven L. Ossad, an independent historian and author, brings to life the old Civil War adage that the conflict was one of "brother against brother." In the case of the prominent Terrill family from Virginia, this could not have been more true. The family was torn apart as one of the Terrill boys, William Rufus, a West Point graduate, decided to remain loyal to his oath and the Union; while the rest of the family declared their loyalty for Virginia and the Confederacy. Because of William's decision, he would forever be ostracized from his family and his home. Ossad details the lives of various Terrill family members, culminating with the battlefield deaths of two brothers, both of which had reached general officer rank. The second article, by Kevin M. Hymel, an author and formerly a historian at the U.S. Army's Combat Studies Institute, investigates the death of Capt. Richard N. Jenson, an aide to Lt. Gen. George S. Patton Jr., during the campaign in North Africa. Hymel, using a previously unpublished firsthand account of Jenson's death in conjunction with excerpts from Patton's own diary and personal correspondence, as well as photographs taken by Patton, pieces together a new version of the story of Jenson's death. A version that points to a cover-up of the exact circumstances and one in which those close to Patton, including General Omar N. Bradley, may have been complicit. This issue also includes an excellent Army Art Spotlight, which highlights more recent work from the Global War on Terrorism by Army artist M. Sgt. Martin J. Cervantez. As always, we feature a few words from the chief of military history, this time on the Center of Military History's accomplishments of the past year; and the chief historian provides an update on the status of the Career Program 61 initiative. As always, I invite readers to send in their submissions and comments.